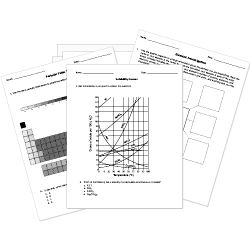 You can create printable tests and worksheets from these Grade 9 Acids and Bases questions! Select one or more questions using the checkboxes above each question. Then click the add selected questions to a test button before moving to another page. Acids have a relatively high pH, compared to water. Which of the following pH values would be acidic? are often slippery substances that are used for cleaning. Bases taste bitter, while acids taste sour. Which pH value indicates a neutral solution? An example of a base is ammonia. In fact, most household cleaners are bases. A strong base is characterized by which of the following? Which of the following pH values would be basic? The pH scale is used to measure . Acidic solutions contain high concentrations of which of the following? All acids are very dangerous and should be avoided at all costs. A strong acid is very dangerous to living things, while a strong base is very safe. If a substance is considered to be a base, that means it has which of the following set of properties? You suspect that a chemical that you are testing in the lab is strongly acidic. What might be its pH? Sugar solution does not change the color of both blue and red litmus paper. Therefore, sugar solution is . When an acid and a base are mixed, a process called produces a water and a salt.